Those who have followed Pino Luongo’s career operating posh Italian restaurants in New York, like Le Madri and Mad. 61, might be surprised to know he’s now running a fast-casual restaurant. Or at least at lunchtime he calls it fast casual. Luongo’s new restaurant’s name — Coco Pazzo — is at least familiar. Back in 1991, the original Coco Pazzo received a three-star review from the New York Times, and a subsequent article noted that the restaurant was serving family-style Italian dishes — the latest trend. Today, Luongo is embracing the new ways that eaters are dining out. This restaurant goes by Coco Pazzo Trattoria at night. 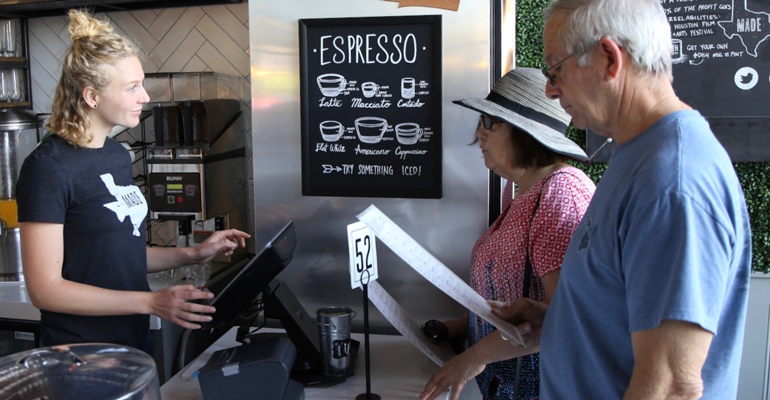 By day, however, it goes by Coco Pazzo Kitchen, when it operates as a fast-casual spot — albeit one with waiter service and a take-out counter. He’s among a handful of restaurateurs who shift their concepts during different dayparts to suit the needs of guests. At Coco Pazzo, there are two distinct menus for day and night. 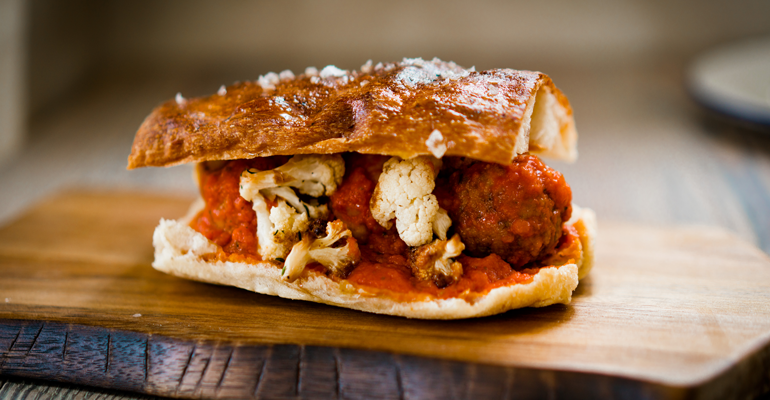 Sandwiches — hot, never cold, Luongo insists — soups and salads make up most of the daytime Kitchen menu, with a few small pastas and main courses. On average, prices range from $10 to $12 per dish. Most ingredients on the day menu show up again in the evening. For example, the $11.50 brisket stracotto, or pot roast, and Brussels sprouts sandwich on the lunch menu is transformed into the pappardelle and brisket “dinner in a dish” entrée for $21 in the evening. The dual concept helps the restaurant stay busy throughout the day and seems to work for the SoHo neighborhood where its located. For lunch, tourists stop by for a quick meal and the takeout and delivery business is bustling, said Luongo. For dinner, the crowd is older in the early evening (what Luongo calls “my old clients”) and gets younger as the night wears on. 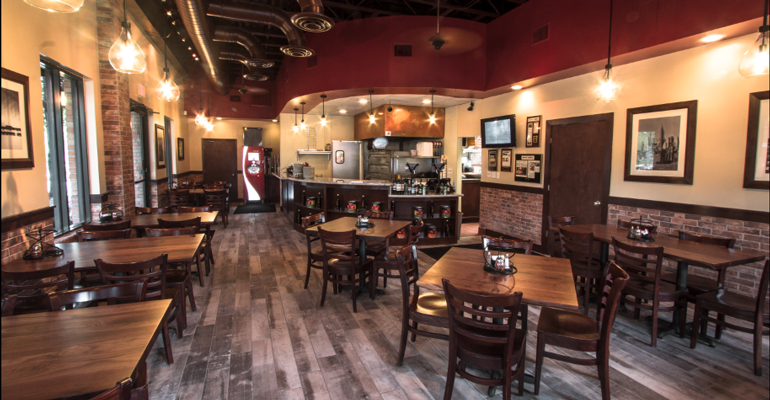 Flex casual is a new concept for Luongo, but Russo’s New York Pizzeria has been practicing the dining style since opening its first location in 1992. There are now 50 locations. In the Houston area, Aaron Lyons opened Dish Society, a dual fast-casual and full-service concept, in 2014. Now he has three outposts. For dinner and weekend brunch, families frequently dine there. For breakfast and lunch, Lyons sees oil-industry workers come in for business meals. While Coco Pazzo has a different menu for lunch and dinner, the space remains mostly unchanged throughout the day. Dish Society has taken the opposite approach. Lunch and dinner menus are the same with the addition of some appetizers and dishes that take a bit longer to cook available only in the evenings. Sandwiches, like grilled pesto chicken, and entrees, like shrimp and grits, range from $10 to $16 and prices don’t change from lunch to dinner. But at Dish Society, the space changes to accommodate dinner guests and servers. 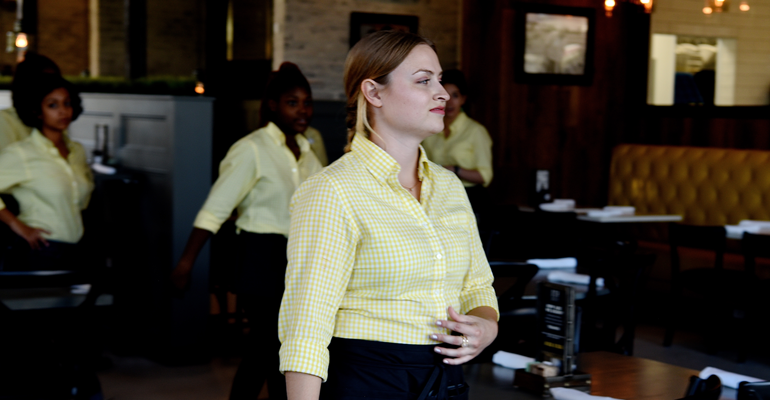 A host station is wheeled in, the POS systems and drink station is hidden away, servers in yellow button-downs replace cashiers in tee shirts. Lyons created his dual concept to offer speed of service to his breakfast and lunch crowd. He slowed-down hospitality, with an emphasis on alcohol sales, to his dinner crowd. “Nobody really wants to wait in line during dinner,” he said. His customers seem to be receptive to his flex-casual format. At many of his locations, Lyons is surrounded by other fast-casual establishments, and he finds he’s on pace with these restaurants for lunch and busier in comparison for dinner. But not every customer is looking for a sit-down experience for dinner. Mama Fu’s Asian House, which opened in 2006 as a flex-casual concept, has recently changed its 20-plus locations to a more typical fast-casual operation. 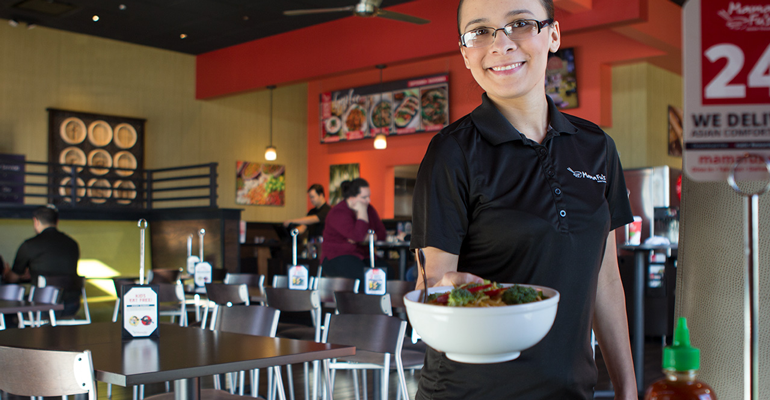 “We found that, originally, people were more wanting to linger and have that dine-out service feel [for dinner],” said Mary Orlando, chief operating officer of Murphy Adams Restaurant Group, which owns, operates, and franchises Mama Fu’s. “Today, Millennials and Gen Zs want to run far away from that. They don’t want to take the time to drive to a restaurant, sit down, order, etc. They see it as wasted time. Part of the evolution of our brand is looking to the next generations and growing with them,” she said.